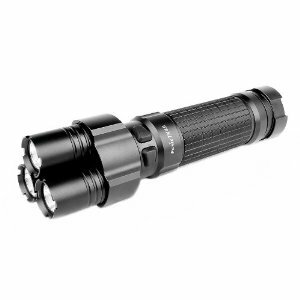 This 760 Lumen LED Flashlight features three lighting heads with a unique appearance that allows for increased heat sinc and higher performance. It throws max 760 lumens output by utilizing three heads of Cree XP-5 R5 LED, which is much brighter than a 10W HID light, and comparable to a car headlight. TK45 is powered by 8 AA batteries to offer four levels of brightness and three flashing modes, with max 232 hours run time and easy operation of the sidewinder dual switch system. All of this remarkable output is housed in a water resistant, tank-like body, that can be easily carried by hand.